Class rings are a time-honored tradition that celebrates the milestones you’ve achieved, while also pointing towards your bright future. Class rings are generally worn by those in high school, college, or who have gone through a military academy. Sometimes, your class ring will be identical to everyone in your class, but often, you get to personalize your class ring. 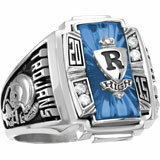 In creating a personalized class ring, you get to express your own individuality. This can be a lot of fun as there are often 1,000s of designs to choose from and an endless amount of engraving combinations. There are a lot of ways to tell people exactly who you are, but the longevity of a class ring is one of the best to forever symbolize everything about who you are right now. So, how do you wear a class ring? That’s what we want to dive into in this article. Are all class ring traditions the same? Great question to ask. While there is probably a similar way to wear your class ring throughout different schools or military academies, there could also be unique circumstances for your school. In this article, we will share the most common ways to wear a class ring, but you may want to double check with the traditions of your school. Which hand should I wear my ring? Normally, class rings are to be worn on your right hand. This is to be sure there is no confusion between class rings and other types of jewelry (such as a wedding ring). What finger should I wear my ring? The standard finger to wear your class ring on is the right hand ring finger. Again, this is why it makes sense to be sure you are wearing it on your right hand. Which way should the ring be facing? The way your ring should face is probably the most asked about question in regards to how to wear your class ring. Traditionally, when wearing a class ring, you are to wear it so that the name of your school is facing you while you are still in school. So, if your arm is outstretched, you should be able to read the name of your school. This is the most accepted form of class ring “wearing etiquette”. Should I change the way I wear my ring after graduation? Yes! This is part of the fun in wearing a class ring! 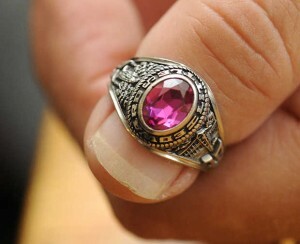 Many schools will have a prestigious “turning of the ring” ceremony at or near commencement. This ceremony is one of pride and accomplishment. There could be several kinds of unique traditions about who turns your ring, but bottom line is that once you graduate, the ring is turned so that your school name is now facing out, towards other people. This turning of the ring symbolizes that you have graduated and are now on your way to do big things in the world. So, go get ‘em! Where should I buy my class ring? This simply could be a matter of preference. Usually, each school has a representative from one of the major ring companies come to provide rings at your school. This could include Jostens, Balfour or Herff Jones (three of the most popular ring and graduation product companies). However, more and more today, students are shopping online to get the same quality ring for a much lower price. SALE!!! ENJOY $35 OFF ALL GUYS AND GIRLS CLASS RINGS AT WEARMYSTORY.COM. At WearMyStory.com, we offer quality class rings by ArtCarved, who is a sister company to Balfour. ArtCarved has been making class rings for nearly 100 years. You can compare our styles and pricing to our major competitors by clicking on this link. You will find that we not only have the same quality rings, but we crush the competition when it comes to pricing. You can save literally $100s of dollars on your ring with our every day low prices, and on top of that, we offer coupon codes for additional savings. So, if you want to overpay for your ring, go with someone else. But, if you want a quality class ring at the lowest price online, be sure to check out WearMyStory.com.